If you're unable to open Windows Media Center on Windows 8 or 8.1, this article will help you to fix it. As far as entertainment on Windows is concerned, Windows Media Center (WMC) is the best deal you can get. You can buy this feature for you activated Windows 8, 8.1 Pro at the cost of few bucks. You can use WMC, a home entertainment center in Windows, to watch and record live TV, create slide shows of your photos, listen to songs in your music library, and play CDs and DVDs. For recording and watching live TV, you’ll additionally need TV tuner; a hardware device. Using an analog or digital TV tuner, you can inject TV signals into your system. 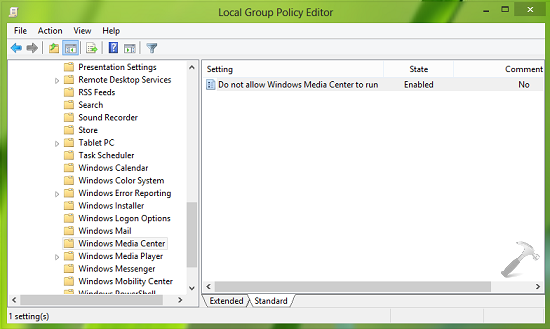 Windows cannot open this program because it has been prevented by a software restriction policy. For more information contact you system administrator. 4. In the above shown window, select Disabled or Not Configured and click Apply followed by OK.
You may now close the Local Group Policy Editor and reboot the machine to get your issue fixed.